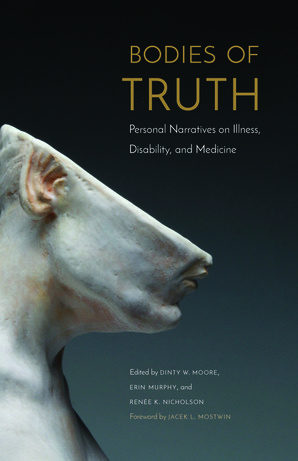 Bodies of Truth, Personal Narratives of Illness, Disability, and Medicine will have its official launch at WVU's Health Sciences Center on Thursday, January 17, at 5 p.m. in the Okey Patteson Auditorium. A reading and discussion of the book will be lead by Matthew Smith, M.D., WVU associate professor and director of neurocritical care, who contributed to the book. The book was edited by Dinty W. Moore, Erin Murphy, and WVU's Renée K. Nicholson. Nicholson works with the WVU Multi- and Interdisciplinary Studies program, and is a frequent collaborator with physicians and other health professionals on narrative medicine projects. “Medicine still contains an oral tradition, passed down in stories: the stories patients tell us, the ones we tell them, and the ones we tell ourselves,” writes contributor Madaline Harrison. Bodies of Truth continues this tradition through a variety of narrative approaches by writers representing all facets of health care. And, since all of us have been or will be touched by illness or disability—our own or that of a loved one—at some point in our lives, any reader of this anthology can relate to the challenges, frustrations, and pain—both physical and emotional—that the contributors have experienced. Bodies of Truth offers perspectives on a wide array of issues, from food allergies, cancer, and neurology to mental health, autoimmune disorders, and therapeutic music. These experiences are recounted by patients, nurses, doctors, parents, children, caregivers, and others who attempt to articulate the intangible human and emotional factors that surround life when it intersects with the medical field. For more information, visit https://humanitiescenter.wvu.edu/events.